Many people are understandably encouraged by the tone of the climate negotiations in Paris: governments are finally taking climate change seriously, and are even expressing a willingness to take concrete steps. Nonetheless, they have once again failed to take the necessary action to prevent catastrophic climate change. In fact, the most effective steps to reduce CO2 emissions were never discussed in Paris. Instead, delegates quibbled over piecemeal quasi-solutions while leaving the systemic root causes of the problem unchallenged. If we are going to limit warming to the 2-degree Celsius benchmark (much less the 1.5 degree limit demanded by the group of “most vulnerable” countries), there will need to be a fundamental shift in the economy: away from growth-at-anycost globalization – a system that is heavily tilted in favor of the biggest corporations and financial institutions – towards more diversified, localized economies that serve the real needs of people and the planet. Such a shift would not only substantially reduce greenhouse gas (GHG) emissions, it would bring a range of other benefits too. It would help to create more jobs; limit the power of global corporations; reverse the erosion of democracy; and reduce fundamentalism, ethnic conflict and even terrorism. And this is its great strength. Here is an opportunity to unite diverse single-issue campaigns across the social and environmental divide: to create a movement powerful enough to overthrow the de facto government of global corporations and banks. 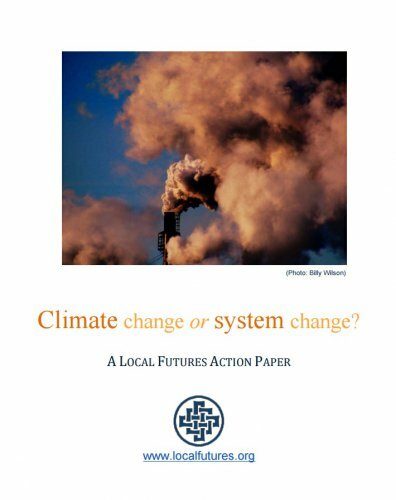 Download Climate Change or System Change?